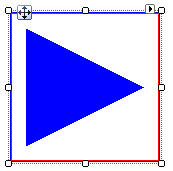 The ArrowPrimitive draws a filled triangular polygon. Orientation is controlled by the Direction property with possible ArrowDirection enumeration values of Up, Down, Left or Right. The arrow is filled with the ForeColor property value. The example below draws a BorderPrimitive and an ArrowPrimitive.